The Toshiba Portege Z930 is the direct successor to last year’s very impressive Z830, one of the pioneers when it comes to business-class Ultrabooks. There’s no signiﬁcant change to the look and feel of the Z930 when compared to the Z820. Of course, that really means that Toshiba feels that the build and looks of the Z830 is good enough to stay on for another generation. Even today, the Z930 remains one the thinnest and lightest business notebooks that money can buy, at just 8.3mm at its thinnest point, and tipping the scales at just over 1kg. Cost-wise, one of the best bits about the Z930 is that it’s priced very attractively. 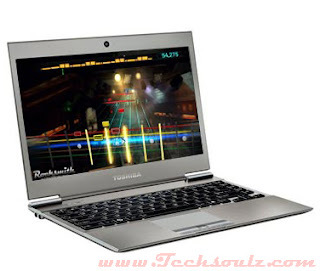 Toshiba prices the Z930 at $1,699 for the base model (Intel Core i5 processor, 6GB of RAM, and 128GB SSD); this makes the laptop much more affordable than other high-end consumer Ultrabooks with SSDs built-in. It’s an especially good deal if you consider the fact that the Z930 comes with a suite of security options including a ﬁngerprint reader, both TPM and BIOS encryption, as well as HDD recovery features. Like most business notebooks, the Z930 comes with a dizzying array of ports that some laptops, let alone Ultrabooks, can only dream about. There are a total of three USB ports (only one USB 3.0 port, though this one lets you charge peripherals while the laptop is in sleep mode), as well as HDMI, VGA and RJ45 ports. The use of a physical Ethernet port is especially handy, as some ultra-thin laptops typically only sport Wi-Fi connectivity, requiring additional peripherals when out and about. Toshiba also makes use of Bluetooth 4.0 connectivity on the Z930, as well as adding both Wireless-N and an SD card reader to the mix. The build quality of the machine is fairly robust for its size, likely thanks to the use of magnesium alloy all over. However, because it’s so slim, there’s no escaping some slight ﬂexing on the body. Furthermore, the thinness also means that the keyboard is a little shallower than we’d have liked, with not very much key travel when in use. One key gripe we have with the Z930 is its measly 1366 x 768 pixel resolution display. While ﬁne for word processing and spreadsheets, there are numerous 13-inch Ultrabooks out there with much better (and higher resolution) screens. The trackpad is also neither large nor clickable, and was one of the things we didn’t like from the previous Z830. Hopefully, Toshiba gets around to building in a better trackpad their future laptops. Ultimately, the Z930 is a very remarkable thin-and-light machine. There’s a good selection of connectivity options, despite its thin stature. There are some nitpicks too, mostly around the choice of screen resolution and a few compromises made to maintain its thinness. Nevertheless, the asking price as conﬁgured makes this laptop excellent value for the money, and even more so for a business-class Ultrabook.